Whenever I realize I’ve been running ragged, I know I’ve fallen into a rut of reactive rather than proactive work. Instead of going about my day steered by plans and intentions, the unstable “whatever comes up” gets to dictate my day. This schedule of working deadline to deadline, fighting fires and flying by the seat of your pants racks up time debt. You’re borrowing from other areas of your life like spending time with your family or on your wellbeing. Humans tend to be bad at understanding how we’ll feel in the future. In our mind’s Pollyannaish eye, the future is a world of order and excellence in which you exercise everyday, you don’t bring work home with you, you finally learn Spanish, you catch up with that friend you haven’t spoken to in forever. In reality, something always comes up, there is always something to do. The problem is that we mistake urgency for importance. “Do this now” is easy to understand and follow, and if something’s urgent, shouldn’t it be done sooner than later? Let’s go back to the very basics and look at definitions. 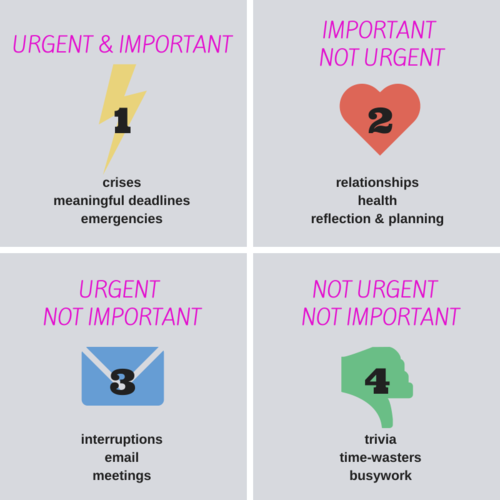 “Urgent” means “requiring immediate action or attention”. “Important” means “of great significance or value; likely to have a profound effect on success, survival, or well-being.” Why are we confusing immediateness with worth? Mistaking what’s urgent for what’s important comes at the cost of our profound goals and values. Smart prioritization requires clearer vision. 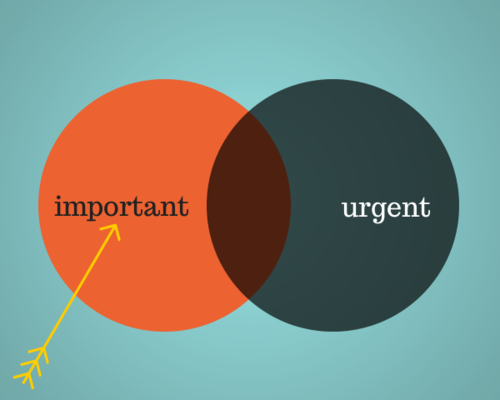 This distinction between urgent and important, of course, is nothing new. Stephen Covey popularized this idea in 7 Habits of Highly Effective People with the time management matrix, which is divided into four quadrants: 1. Urgent and important, 2. Not urgent but important, 3. Urgent but not important, and 4. Neither urgent nor important. You have to deal with Quadrant 1 tasks, which are integral to keep going. Many people get stuck in Quadrant 3 —vanity work and tasks that feel important, often by request, order, or some external directive. Quadrant 4 activities are the trivial and the useless. In a way, this simplifies the matrix even further — focus on what’s important. Urgency plays tricks on your mind, and you end up spending time doing things at the expense of more valuable activities. Emails, for example, will always seem more urgent and important than they probably ever are. It’s wiser to trust in importance as your true north. 1. Figure out what matters. Spend some time to ascertain what really matters to you. What do you find significant and valuable? How will you contribute towards your success and well-being? What’s been nagging in your mind but you never seem to get around to doing it? Maybe it’s spending more time with your parents, reading more books, or doing something creative. Maybe it’s learning a skill, volunteering, or meditation. Some activities are less fun and fulfilling but still valuable, like finally getting to the doctor for a check-up, setting up a monthly budget, planning out next week so you’re not running around like a headless chicken. Sometimes important things are just not the easy choice. Saying no to the non-important stuff can be hard, and it’s often harder to say no to other people than to say no to yourself. Learning to delegate, to let things go, and to make peace with that letting go is surprisingly difficult and can take constant practice. 2. If something is important, assign a time for it. There are two simple ways to set yourself up for Quadrant 2 activities. Set a schedule to meet your goals if you want to establish a good habit, something you’d like to do regularly, like eat healthy, exercise, read more, practice your writing, learn a new skill. Doing little by little consistently, you’ll build up a practice. When we can see clearly and focus on what is important and meaningful, it’s so much easier to enjoy the present.